If William Shakespeare applied for a job in a corporation today, would he get it? Or would he be rejected for being unable to speak the fuzzy and sometimes nebulous managerese? 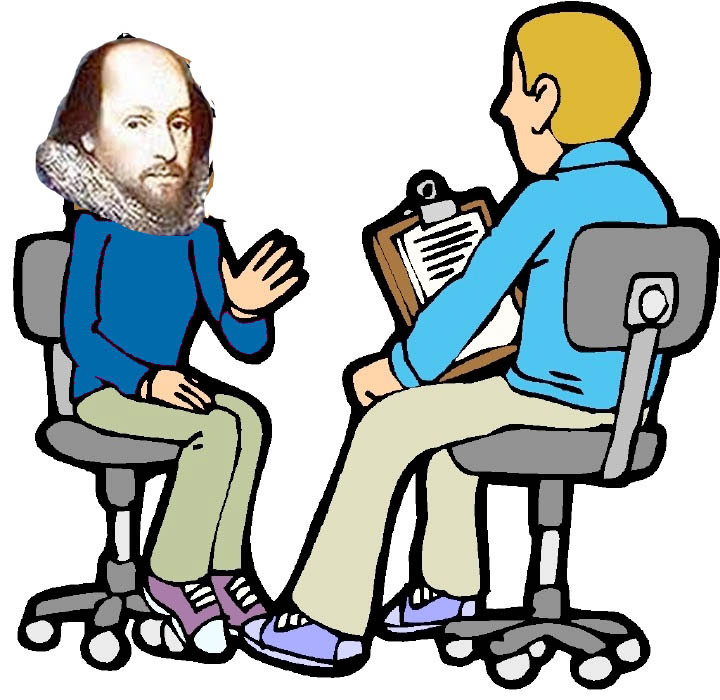 The question must remain unanswered but let’s imagine that the ghost and spirit of Shakespeare enter into your soul, so that you can fit Shakespearean language to situations you encounter or questions you are asked. In this session you are applying for a job. (HR) refers to a Human Resources Representative, the initials WS are self-explanatory. On being called in for an interview. HR Do you feel comfortable? WS. “I am distilled to jelly by the act of fear.” (Hamlet) Use caution, the interviewer may think you are serious. HR. Do you consider yourself a doer or a doubter? HR. Why do you want to work? Your resume shows some unexplained gaps in employment. HR. I see that you have not worked from date x to date y. Why? …then proceed with whatever explanation you may have on the issue. HR Are you a reliable person? Or other oblique words to that effect. HR. Do you like people? HR How do you react to criticism? HR. How do you deal with an angry customer? HR. How do you feel about people who have a very hard time to understand even simple concepts? HR How are your verbal communications? HR What can you do for us? HR Do you consider yourself an optimist or a pessimist? If the interviewer does not give you any indication as to your compensation. HR What do you think of Hillary Clinton? HR What do you think of George W. Bush, Cheney etc.? HR Are you a communist? Though we can never be conclusive on matters of physiognomy, it is reasonably easy to detect (from facial countenance, body language and demeanor), if you are facing a neo-christian fundamentalist or a softer member of the bourgeosie. On the other hand, this Shakesperean answer is not a justification for neo-liberal capitalism in its most grotesque actual forms. Rather, it is a recognition of the individual differences that, for good or for bad, are one of the positive things about the race of the so-called humans. The interview is getting to the end and you want to ask what next. WS. “When shall we two meet again? Again, caution, especially if the interviewer is a female. Or she may suspect you think she is a witch. This entry was posted in After Dinner Quotes, Amusing Shakespeare, Answers to Interviews, Business Presentations, Elegant Shakespearean Quotes, Shakespeare at Work, Shakespeare in Management, Social Exchanges Shakespeare style and tagged answers to questions, applying for a job, job interviews, shakespeare quotes on work, shakespeare words for excuses. Bookmark the permalink.